On Saturday 12th July 1969, I took part in my very first marathon, having reached the ‘legal’ entry age of 21. The event was the Inverness to Forres Marathon part of the well-organised Forres Highland Games, which continues to flourish today. I have to laugh at my training schedule: the university track season, endless repetition sessions, a 3.58.2 paarlauf mile, PBs for one mile, three miles and 5000 metres, plus a few longer hungover yet hard Sunday runs from Woodie’s house (usually failing to hang on to the great man) and a couple of ten mile races. The final regime was an exhausting eight days totalling 100 miles in seven runs (to prove I could handle the distance! ), a 6 mile grass track race the following Monday, a six mile jog on Wednesday, an inexplicable short rep session on Friday and off to the marathon on Saturday. The start was on top of a short but steep hill on the edge of Inverness, followed by the long straight fairly flat main road to Forres, running on the right hand side of the road. The only advice was that, when you passed under the railway bridge at Nairn, there were ten miles to go to the finish in the Games arena in Grant Park, Forres. A newspaper clipping shows Ally Wood striding off rapidly, followed only by Don Ritchie. Since it was a hot day, they were both sporting jaunty knotted white hankies, scout neckerchief fashion. There were only 14 intrepid starters. My diary notes: “Lots of food and drink before. Watched Wood shoot off while I ran steadily with the second pack. After 10 miles, I broke away. Passed several, feeling good, then worse. However saw the foolhardy DR ‘dying’ ahead, so passed him at 18 (he dropped out at 23 – mind you, he had won the 17 miles Mamore Hill Race from Kinlochleven a week earlier). Did the rest on my own – hard but not competitive. Sponges at every stop and two small drinks of water. Okay state, considering, at the end. Sore thighs and feet but no blisters. Might have caught Hughie Mitchell if I had pushed it.” 1st AJW (2.27.44), 2nd Hugh Mitchell (Shettleston) 2.38, 3rd Colin Youngson 2.41.13. Third prize was a pedestal ashtray – just what an improving young runner might have desired, not. After a holiday, the next race I contested was another ‘you have to be 21 at least’ event – the gruelling Ben Nevis race – in those days, we used to run everything! Alastair Wood had made major headlines on 9th July 1966 when he ran a fantastic British and European Record marathon (2.13.45) in this event. (This time is now fully accepted by the Scottish Association of Track Statisticians.) He had peaked brilliantly by the unusual method of running as many as 60 x 220 yard strides! On the 9th of July he “was full of energy, his knees coming up of their own accord!” There was a following breeze, but there is no doubt that he was capable of such a time, which was later ratified. (Certainly, after Ron Hill broke the European Record at the 1970 Edinburgh Commonwealth Games, ‘Athletics Weekly’ listed Alastair’s Forres time as being as down to 5th on the British All-Time list. – Ron Hill 1970 2.09.28, Bill Adcocks 1968 2.10.48, Jim Alder 1970 2.12.04, Don Faircloth 1970 2.12.19, and Alastair Wood 1966 2.13.45.) It was a day on which Alastair felt he could “run forever” and local rumour has it that he claimed to be “the fastest white man in the world” [behind an African( Abebe Bikila) and a Japanese (Morio Shigematsu)]! 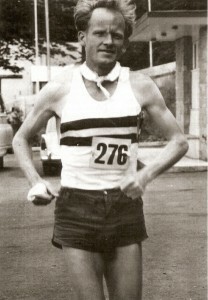 Donald Ritchie ran the Inverness to Forres in 1966, 1967, 1969, 1972 and 1973. He remembers that the 1966 course started where the industrial estate is now, with about a mile to run before going under the railway and joining the A96 south bound. His training diary entry follows. “I travelled to Inverness with Alastair for the Inverness to Forres marathon, which is part of the Forres Highland Games. Weather conditions were ideal: a cloudy day with a following wind. Alastair led, followed by Ron Coleman, Peter Duffy, myself and Hugh Mitchell. By ten miles Alastair was well away and Coleman had got away from Mitchell, who in turn had pulled away from me and I had a gap on Peter. My time at ten miles was given as 50.05, which is suspicious. We had a refreshing shower of rain, which lasted for about 30 minutes, between ten and twenty miles. My time at 20 miles was given as 1.53.30 and from there I could see Hugh pass Ron. About three-quarters of a mile later he stopped for a drink and then started jogging. I passed him soon after this and the sun broke through, making the temperature rise considerably, so that it became very hot. We left the A96 at Brodie, crossed the railway line and followed a minor road, before re-crossing the railway to rejoin the A96. By this point I was really feeling grim and felt like I needed to stop for a serious call of nature. I managed to keep going and the feeling passed. I was some two miles from Forres and gradually it got closer. There are two nasty little hills as you enter Forres, which I felt hard. I was very glad to see the sports field in Grant Park and I was soon on my last lap. Alastair’s time was a great 2.13.45, the fastest in the world this year. Hugh Mitchell ran 2.25.16 and I achieved 2.29.08, with Brian Goodman 4th in 2.38.21 and Peter Duffy finished fifth of the eleven starters. I had two blisters on my right foot.” It seems likely that the course measurement may have been done in a car; and therefore the ten mile point seems a little early but the twenty mile point seems right enough. Add a following wind and AJW’s great form and the fantastic finishing time is explained. In a ‘Scotland’s Runner’ interview by Mel Edwards in 1986, Alastair himself claimed that the course had been measured by surveyors and the North of Scotland AAA. Before that marvellous run in 1966, Alastair had won the 10th July 1965 inaugural (?) event in 2.29.54, with Duncan Davidson of Forres Harriers third in 2.47.06. On the 6th of July 1968, Joe Clare (AAAC), a very strong runner (but certainly not as good as AJW) won in 2.18.43 (and his time IS accepted by the International Association of Road Running Statisticians, so why not Alastair’s runs in 1966 and 1967? Sounds like victimisation.) Therefore 1969 was Alastair’s fourth victory. On Saturday 6th July 1974, just two weeks after finishing third in the Scottish marathon championship, representing ESH, I turned up for what turned out to be the final Inverness to Forres. I have a copy of the race instructions as well as the precise locations of the ‘refreshment stalls’. The race started now “on Longman Road at 1 p.m. sharp, directly opposite Lamp Standard on left of entrance to Brown Wooden Building, midway between Auto Sales and Ferries Garage. Runners must keep on the left side of roadway.” One official was instructed to “run and open the Canvas Gate near to the Cricket Pavilion so that runners are not hindered in getting into the Park”. However my pot-hunting attempt was doomed. At the start I met the redoubtable Sandy Keith, a training partner and major rival from Edinburgh AC. At the Scottish marathon, he had led for some time then ‘blown up’ a little to finish fourth, four minutes behind me. However his powers of recovery were far greater. I threw in several fartlek bursts during the first ten miles of the Forres race, failed to shake Sandy, and then ‘gave up’ and watched him stride away out of sight. He won in 2.26.28, whereas I plodded in second in 2.33.44. I have the finisher’s certificate, signed by Forres Harriers official Sandy Brander, who did a lot for North Athletics, along with Tom Mackenzie, a cheerful, charismatic Inverness stalwart. A year later, I finally obtained a coveted ‘North of Scotland Milk Marketing Board’ plaque, for winning the Forres Highland Games Road Race, but the distance had been reduced to a hilly ten miles. In 1983 I won the event again, over a similar course measuring 11 miles plus.